In both area and population, Saarland is the smallest German state, apart from the city-states Berlin, Bremen and Hamburg. 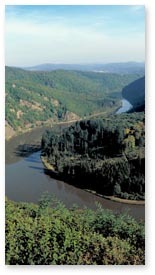 Saarland is named after the Saar River, which is a tributary of the Mosel River, which, in turn is a Rhine tributary. The state borders France (département of the Moselle) in the south and west, Luxembourg in the west and the German state of Rhineland-Palatinate in the north and east. Saarland has changed nationalities eight times during the past 200 years. In the 20th century, it became French after both the First and the Second World War, yet each time returned to Germany after a plebiscite. The Saar Treaty of 1956 was the last international border change in Europe until the Fall of Communism. The treaty also established that French, not English as in the rest of West Germany, should remain the first foreign language taught in Saarland schools; this provision is still largely followed today, although no longer binding. Historically, most of the workforce in Saarland was employed by the coal and steel industries. The Völklingen Ironworks UNESCO world heritage site is the state’s most well-known cultural attraction. The innovations of our modern era have changed everyday life considerably and the people of the Saarland have successfully taken on new industries, technologies and services. Most inhabitants live in a city agglomeration on the French border, surrounding the capital of Saarbrücken, which also is home to the well-known Universität des Saarlandes. One essential character trait that has remained unchanged through Saarland’s turbulent history and changes in life-style, is their love for the state’s regional cuisine. Whereas Southern Germany is best-known for its dumplings and egg noodles (Spätzle), Germany’s western-most states – North Rhine-Westphalia, Rhineland-Palatinate, and Saarland – are a potato-lover’s paradise. The vast majority of typical recipes from Saarland center around this über-tuber. In the Saarland dialect, potatoes are called “Grumbeeren” or “Grumbieren” and the people from the region love their local potato specialties, the names of which will never be found in standard dictionaries and require translation even for non-local Germans. “Dibbelabbes” means a hash-style one-pot potato dish with cured meat, “Grummbeerkieschelscher” are crispy potato pancakes, “Hoorische” and “Gefillde” are types of potato dumplings which are usually served with a creamy bacon gravy. “Kerschdscher” translates as diced potatoes sautéed in hot fat, a dish with white cabbage and potatoes goes by the name of “Kappes und Grumbeere”. These are but a few potato specialties from Saarland. A traditional side dish which often accompanies these hearty potato dishes is a dandelion salad called “Bettseichersalat”. No regional cuisine in Germany would be complete without its meat specialties. As is the case for all of Germany, grilling or barbecuing is extremely popular in Saarland – so much so that people there have come up with a special regional term for describing it. The verb Schwenken describes not only the mere act of grilling but more importantly the social event, the BBQ party with neighbors and friends. The noun Schwenker designates a specific kind of grill. Unlike the common standup grill, people in the Saarland prefer a tripod construction with a grate suspended by chains. The Schwenker owes its name to the swaying motion created by positioning meat on the grill. Schwenker may also be used to refer to the host or the person operating the grill. It is a common tradition for guests to comment on the skills of their host and to enrich the grilling event with their Schwenker experiences and stories. A popular type of sausage in Saarland is a Fleischwurst-style pork sausage, elegantly named Lyoner after the French city of Lyon, again paying tribute to its neighbor. (Note that in other regions of Germany Lyoner may refer to a different type of sausage, sometimes a type of cold cut.) Lyoner Pfanne, a skillet dish with sausage, potatoes and fried eggs, and a rustic stew called Lyoner Gulasch are two popular dishes featuring this sausage. As far as beverages are concerned, the Saarland is part of Germany’s most well-known German wine-growing region called Mosel-Saar-Ruwer, named after the river Moselle and two of its tributaries. Vineyards along the lower reaches of the Saar river yield wines prized by connoisseurs. Apfelwein (apple wine) or “Viez” in the regional dialect is considered by many to be the quintessential Saarland beverage. Similar to the states of Hesse with its “äppelwoi”, Swabia with its “Moschd” and neighboring France with its “Cidre”, the alcoholic apple beverage has obtained cult status. The word “Viez” is derived from the Latin expression “Vice-Vinum” which roughly translates as deputy wine. The town of Merzig has an entire festival dedicated to the popular beverage. The “Viezfest” is one of the region’s most popular events. While traditionalist would frown on drinking anything but pure Apfelwein, many Germans like to mix it with various other beverages. For instance, Apfelwein mixed with mineral water (Mineralwasser) produces the so-called Sauergespritzte or Apfelweinschorle. To make a Süßgespritzte you mix Apfelwein with sodas like 7-Up or Sprite. Another popular alcoholic beverage from the Saarland is a plum schnapps called “Quetsch”. In the non-alcoholic spectrum, the Saarland is a major producer of high quality fruit juices.